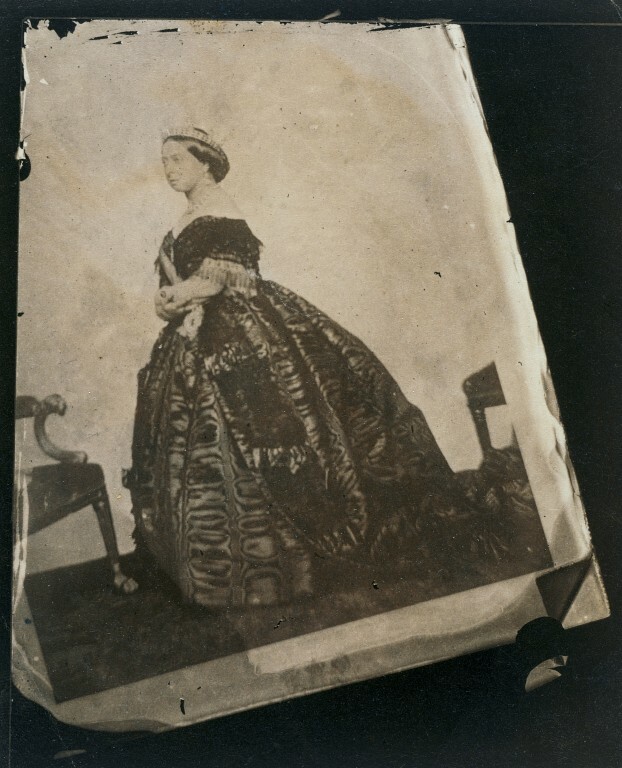 Charles Clifford took the portrait in this photograph on 14 November 1861 at Windsor Castle. Queen Victoria (ruled 1837–1901) noted in her Journal that she had ‘dressed in evening dress, with diadem & jewels’ and was ‘photographed for the Queen of Spain by Mr Clifford. He brought me one of hers, taken by him’. The queen wears mourning for her mother, the Duchess of Kent, who had died on 16 March 1861. A copy in the Royal Photograph Collection shows her dress coloured purple. If accurate, this image might be one of the last of the queen wearing a colour, since her husband, the Prince Consort, died a month later. 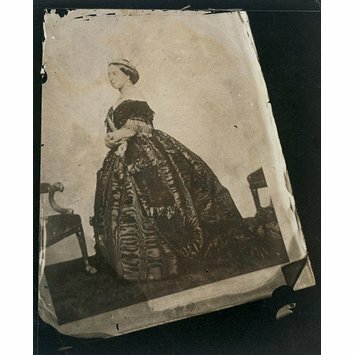 According to Frances Dimond, Curator of the Royal Photograph Collection, this image ‘seems to be a trial-proof of a copy of the portrait, preserved for no known reason, and now an object with its own oblique interest’. The photograph gives us an oblique view into the large-scale industry by which portraits of royalty were made and sold (by the 100,000) in the 1860s. This is a photograph of a photograph, perhaps a trial proof. The original has been identified by Frances Dimond, curator of photographs at the Royal Archive, Windsor Castle. The original was taken by Charles Clifford (British, c.1820-63), photographer to Queen Isabella II of Spain. Clifford photographed Queen Victoria for the Queen of Spain on 14 November 1861.